If last night's review of "The Wire" series finale, and/or my interview with David Simon were too long for you to read, I combined and condensed elements of each for my column in today's paper. Have you heard anything about when HBO will release the Season 5 DVDs? I know with the Sopranos, they seemed to get them to market as quickly as possible after the finale. I mean, theres no reason to wait, right? Since there won't be anymore seasons. So Aln, since he wouldn't answer the two main questions I had-- the Omar/Marlo similarity issue, and the symbolisim of the trains, what's your theory on those two things? I didn't see it as a very cryptic or esoteric theme, its something that was mentioned by Brother Mouzone when he came to see the housing projects being leveled. The tracks represent Reform, the slow train which, in all five seasons of The Wire (as far as I can remember), has never actually come on screen. Basically, waiting for a broken institution to reform itself is a wasteful endeavor, and characters find themselves waiting for a train which will never come. Alan, are you going to be posting about last night's Breaking Bad? I always look forward to your thoughts. I think the trains represent a lot, but let's not forget that trains allowed the robber-barons to consolidate their power into fewer hands than ever before. And let's not forget John Henry, who invested too much of his identity in his work, and become less validated as his job became mechanized. And he was able to beat the machine -- but only by driving himself to death. I don't like 1:1 symbolism; I think the train symbolism feels right because it ties to so many different threads of the same themes in so many ways. It seems simplistic to try and nail down the most precise, most exact one. I think the idea of the trains simply representing a generic Rorschach inkblot test of themes is charming, but I don't think this applies to The Wire. Simon was building something, and all the pieces matter (sorry for that). Everything meant something more specific than a vague "what do YOU think the trains mean" explanation. It seems clear in his interviews that few people have approached him with a correct explanation. yeah, I was wondering about the 5 season boxset, too? I hope we don't have to wait a year for season 5, then another year for the boxset! Sorry if I'm late to the party in case someone mentioned this link already. But I think Blake Leyh kind of confirms many of the previous comments about the Train mystery with his comments on the Season 3 finale song, "Fast Train." See this HBO link. So I'm reading another columnist's review of the finale (and I can not for my life remember where I read it so if you know, please inform) and I was taken back by an observation she made. After watching Michael rob the rim shop she came to the conclusion that Michael was the new Marlo. MARLO! Hello, the shotgun, the wise crack, "that's just your knee," the "pleasure doing business gentlemen." And then when someone debated her on the topic in comments, her repsonse was "agree to disagree." Come on. Someone who does not get this show as much as that has no business writing about it. And Alan, I know you aren't going to call out another writer but if you know who this is, do you think you could fill her in. Sorry, I just found that annoying and had to get it off my chest. I don't think Simon "jumped the shark" with the homeless killer story. In the first four seasons, the point that Baltimore was a severely dysfunctional city was driven home time and time again by Simon. There wasn't one point in the homeless killer plot line that I thought to myself, "Oh come on". 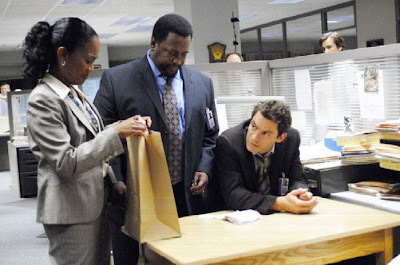 And at no point during their operation did McNulty or Freamon seem at all worried that anyone would figure it out. Because they knew how everything worked... they'd finally figured it all out and knew the system was bankrupt. And it also was key to Simon's larger point about the media. The fact that Freamon and McNulty had to keep dressing up the killings more and more to make the Sun report it. I think the element of "the street" and the police in this show was just so unbelievably good. The characters, the plots, everything about it, that no Wire fan ever really wanted to see anything else divert the show from that story. But when you step back and look at the homeless killer plot line, it really was a stroke of brilliance in my opinion. And it drove home Simon's point... if something as outrageous as cops fake-killing homeless people can't make a dent in the system, what ever will? Sorry- no Donut or officer Walker. I wanted to see Donut too, he was adorable.